“If I was an anarchist or even a regular protester,” explained the president of the Seattle Police Officers’ Guild Ron Smith, “I would probably not want to be infiltrated by the police… Just like the dope dealer on Third and Pike doesn’t want to get busted. That’s the price of doing business. It’s the whole package.” This startling bit of honesty from the Seattle police regarding their imperative to infiltrate and spy on social justice protests came as Ansel Herz, a reporter for the local newspaper The Stranger, questioned Smith regarding undercover cops at a Black Lives Matter protest last December. For those involved in Left protest movements this is hardly news. I remember my early days in the antiwar movement at Texas Tech University. During the first rallies protesting the invasion of Iraq in 2003 local police with their crew-cuts, wraparound shades, and shirts tucked into Wrangler jeans would “blend effortlessly” into the crowd of college students. Campus police even intruded into a graduate student’s office—much to his surprise—in order to peruse our flyers and posters that were stored there. A year later an investigation by Salon revealed that police had infiltrated antiwar groups in Boulder, Fresno, Grand Rapids, and Albuquerque. A federal prosecutor even demanded Drake University turn over all of its records regarding an antiwar conference held there by the National Lawyers Guild. 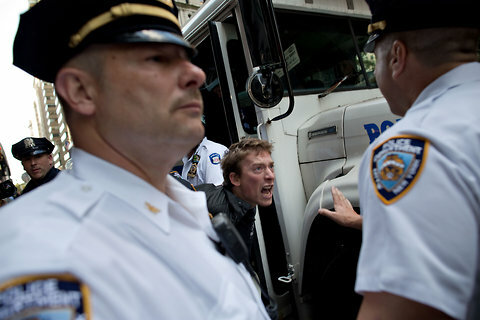 Detective Wojciech Braszczok was one of many undercover cops infiltrating the Occupy Wall Street movement in New York, a fact that came to light after his unrelated arrest following the release of a video of him violently assaulting a motorist. Braszczok’s participation in the movement went beyond monitoring protests as he insinuated himself deep into the personal lives of Occupy members even attending birthday parties—all the while collecting “intelligence” for the NYPD. Other undercovers in the Occupy movement worked as agent provocateurs “being paid to go to these protests and put us in situations where we’d be arrested and not be able to leave” as Occupy member Marshall Garrett discovered after his 2011 arrest. During the 2010 protests against budget cuts and tuition hikes on West Coast college campuses university police sent a spy into meetings of the University of Washington based UW Student Worker Coalition. At UC Davis the administration worked with faculty and police to form the Student Activism Team, a taskforce charged with infiltrating and surveilling Left groups on campus. Even more disturbing, a lawsuit filed last year by the Evergreen State College chapter of Students for a Democratic Society revealed further details of a surveillance ring dating back to 2009 and built around John Towery a member of the Army’s Force Protection Service who had infiltrated the Olympia, Washington student group. According to emails Towery was trying to “develop a leftist/anarchist mini-group for intel sharing and distro” with campus police and police departments in Everett, Spokane, Portland, Eugene, and Los Angeles as well as with various branches of the military. Last week documents obtained by The Intercept revealed that undercover officers for the NYPD regularly attended Black Lives Matter events. Pictures of activists are kept on file by the department and their movements are tracked. In a statement on these revelations the Metropolitan Transit Authority which has been using its counter-terrorism task force to also spy on Black Lives Matter justified the spying by equating protesters with terrorists. And this is not just the view of local police departments, the Department of Homeland Security and the FBI’s Joint Terrorism Task Force have both been monitoring Black Lives Matter protests across the country showing the dangerous and unfounded link in the minds of police between social justice movements and terrorism. It is notable that the problem of police infiltration is unique to Left-leaning political groups. Right wing organizations like the Tea Party, the Oath Keepers, and the Ku Klux Klan are more likely to have police as enthusiastic members than moles. Even the FBI’s oft celebrated infiltration of the Klan during the Civil Rights Movement led to more cheerleading for Klan activity than arrests of its members. While police frequently paint Left organizations as violent in order to justify the violation of people’s right to organize politically these right wing terrorist groups are regularly leftunmolested by the supposed keepers of the peace. There are many people who think the police exist to fight crime. The reality is that the police exist to maintain the status-quo with the rich on top and everyone else fighting for scraps. During the uprising in Ferguson last year comedian Chris Rock commented, “If poor people knew how rich rich people are, there would be riots in the streets.” The police represent the first line of defense between the rich and the rioters. Those involved in the Black Lives Matter movement—the latest challenge to the racist status-quo—learn quickly the true function of the police as they are shouted at and insulted by police in riot gear who hem in their marches, as they have their photos taken by police surveillance teams for further investigation, as they deal with the never ending stream of plain-clothes cops intimidating, monitoring, sowing seeds of distrust. Knowing the political role of the police perhaps it is time to stop hoping for reform and start imagining a world without the police. An Occupy Rochester protest shut down East Avenue for a brief period Saturday evening as a group of over 150 people marched westward down the street and sidewalk. The protest is believed to have begun in Washington Square, and at some point it poured onto East Avenue. At one point, Rochester Police vehicles began following the protesters as they moved down the street. Then marchers ran into a wall of officers near the intersection of East Avenue and Union Street. Police say they began arresting individuals when they refused to disperse. But marchers continued to push past officers moving mostly onto the sidewalk and side of street. The march continued for a short distance west on East Avenue, even passing by News10NBC building. Police say they arrested 18 individuals for disorderly conduct. Among the arrested was Emily Good, who you may remember was arrested last summer while videotaping a traffic stop outside her home. Laura Brown says the protest was an attempt to re-ignite the Occupy Movement in Rochester. She also believes the arrest will inspire the movement rather than stop it. Some of the arrested have been released on bail, and police say they will have more information regarding the arrest on Monday. Several Occupy protesters have been charged with rioting for their demonstrations at the Cruz family home. Local protester Nick Espinosa, who made a name for himself by dropping pennies on Tom Emmer and glitter-bombing politicians across the county in addition to his work with Occupy Minnesota, was charged yesterday with third-degree riot (a gross misdemeanor), interfering with a peace officer, trespassing, disorderly conduct, and presence at unlawful assembly. Espinosa did not return phone calls seeking comment but Occupy Homes released a statement blasting the city attorney for “escalating” charges against the protesters. Initially, the protesters at the Cruz family home were charged with simple trespassing. Despite the new charges, Occupy says it will continue its protests. “This attempt to silence and stifle anti-foreclosure organizing will not deter us from fighting for our homes, our families, our neighbors, and our futures,” Occupy said. It is unknown at this time how many other protesters were hit with the new charges. Espinosa is one and the group acknowledges that “at least three arrestees (though likely more)” have been affected.